By Anthony Tockar, Verge Labs. Data ScientistTwo words, when combined, and placed under one's name on a resume or LinkedIn profile, demonstrably lead to a deluge of job opportunities, random connection requests, and attention from headhunters. 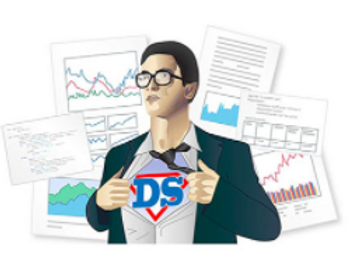 Enter the Association of Data Science Professionals. With guarantees on the credibility of chartered candidates, companies can now be safe in the knowledge that their data scientists are the real deal. You legally can't hire an accountant or actuary who isn't a member of a professional body (in most cases), and you wouldn't want to. The Institute of Chartered Accountants (for example), the Actuaries Institute and countless others have rigorous qualification criteria and require members to uphold professional and ethical standards. An Association of Data Science Professionals can provide the same guarantees. Except there's one problem. Few data scientists worth their salt would join such a thing. The focus in the majority of data science courses is on the final point. Granted, there are some courses that also focus on communication, but the fact remains that data science is an applied discipline, and is learnt best by doing. The above reasons are why aspiring data scientists are encouraged to share their work online (via blog, github, kaggle, etc) - it's a far stronger signal than a degree or an accreditation. Who will administer such a program? Even experts in this field have knowledge that is obsolete in many areas, and even then there are few agreed-upon "unicorns" around. Can it keep up? The pace of innovation is frantic, and the best education programs are constantly revised. Will it stifle innovation? Data science is a young field, consisting of practitioners with wildly varied backgrounds. Conforming to a homogeneous syllabus could limit the ability for certain areas and applications to reach their potential. The assumption in the above paragraphs is that technical qualification is a requirement for such a body. Certainly, there are other industry groups that have no such requirement, but few could argue that membership of such a group provides much of a signal. The field is far too large for any operator to hope to license members with any objectivity apart from standardised testing, and thus we are drawn to this mechanism as a foundational plinth. You could argue that the reasons provided above are just a feature of the youthfulness of the profession. Certainly, as data science matures many of the methods used commonly today will be seen as standard practice. The pace of innovation in certain areas will undoubtedly plateau. But the "data scientist" of the future will have quite a different skillset to data scientists today. What we now call data science will splinter into various sub-fields, each with its own set of standards and archetypes. Perhaps some of these may be well-suited to institutional representation. Today - not so much. Bio: Anthony Tockar is a director at Verge Labs and an organiser of several meetups in the Sydney data science community.